Marble herm in the Vatican Museums inscribed with Aspasia's name at the base. Discovered in 1777, this marble herm is a Roman copy of a fifth century B.C.E. original and may represent Aspasia's funerary stele. Aspasia (c. 470 B.C.E. - 400 B.C.E.) Greek: Ἀσπασία) was a woman rhetorician and philosopher in ancient Greece, famous for her romantic involvement with the Athenian statesman Pericles. She was born in the city of Miletus in Asia Minor, and around 450 B.C.E. traveled to Athens, where she spent the rest of her life. She is thought to have exercised considerable influence on Pericles, both politically and philosophically. Plato suggested that she helped compose Pericles' famous Funeral Oratory, and that she trained Pericles and Socrates in oratory. After the death of Pericles she was allegedly involved with Lysicles, another Athenian statesman and general. She had a son with Pericles, Pericles the Younger, who was elected general and was executed after a naval disaster at the Battle of Arginusae. Aspasia appears in the philosophical writings of Xenophon, Aeschines Socraticus, Plato and Antisthenes and is regarded by modern scholars as an exceptional person who distinguished herself due to her political influence and intellectual charisma. Most of what is known about her comes from the comments of ancient philosophers and writers, some of whom were comic poets who wished to disparage Pericles, rather than from factual accounts. Scholars believe that most of the stories told about her are myths reflecting her status and influence. Aspasia was born around 470 B.C.E. in the Ionian Greek colony of Miletus (in the modern Aydin Province, Turkey). Her father's name was Axiochus. She was a free woman, not a Carian prisoner-of-war turned slave as some ancient sources claim. She probably belonged to a wealthy and cultured family, because her parents provided her with an extensive education. The circumstances that took her to Athens are not known. The discovery of a fourth-century grave inscription that mentions the names of Axiochus and Aspasius has led historian Peter J. Bicknell to attempt a reconstruction of Aspasia's family background and Athenian connections. His theory connects her to Alcibiades II of Scambonidae, who was ostracized from Athens in 460 B.C.E. and may have spent his exile in Miletus. Bicknell conjectures that, following his exile, the elder Alcibiades went to Miletus, where he married the daughter of a certain Axiochus. Alcibiades apparently returned to Athens with his new wife and her younger sister, Aspasia. Bicknell argues that the first child of this marriage was named Axiochus (uncle of the famous Alcibiades) and the second Aspasios. He also maintains that Pericles met Aspasia through his close connections with Alcibiades's household. According to the disputed statements of the ancient writers and some modern scholars, in Athens Aspasia became a hetaera. Hetaerae were professional entertainers of upper class men, as well as courtesans. They differed from most Athenian women in being well educated, having independence, and paying taxes. According to Plutarch, Aspasia was compared to the famous Thargelia, another renowned Ionian hetaera of ancient times. Being a foreigner and possibly a hetaera, Aspasia was freed from the legal restraints that traditionally confined married women to their homes and could therefore participate in the public life of the city. After the statesman Pericles divorced his first wife (c. 445 B.C.E. ), Aspasia began to live with him, although her marital status remains disputed as she was not a citizen of Athens. Their son, Pericles the Younger, was probably born before 440 B.C.E. because it is reported that she later bore another child to Lysicles, around 428 B.C.E..
Aspasia was noted for her ability as a conversationalist and adviser rather than merely an object of physical beauty. According to Plutarch, their house became an intellectual centre in Athens, attracting the most prominent writers and thinkers, including the philosopher Socrates. The biographer writes that Athenians used to bring their wives to hear her discourses. Aspasia’s relationship with Pericles and her consequent political influence aroused public sentiment against her. In 440 B.C.E., Samos was at war with Miletus over Priene, an ancient city of Ionia in the foot-hills of Mycale. The Milesians came to Athens to plead their case against the Samians, but when the Athenians ordered the two sides to stop fighting and submit the case to arbitration at Athens, the Samians refused. In response, Pericles passed a decree dispatching an expedition to Samos. The campaign proved to be difficult and the Athenians endured heavy casualties before Samos was defeated. According to Plutarch, it was thought that Aspasia, who came from Miletus, was responsible for the Samian War, and that Pericles had decided against and attacked Samos to gratify her. Plutarch reports that before the outbreak of the Peloponnesian War (431 B.C.E. - 404 B.C.E. ), Pericles, some of his closest associates and Aspasia faced a series of personal and legal attacks. Aspasia, in particular, was accused of corrupting the women of Athens in order to satisfy Pericles' desires. According to Plutarch, she was put on trial for impiety, with the comic poet Hermippus as prosecutor. All these accusations were probably unproven slanders, but the experience was bitter for the Athenian leader. Although Aspasia was acquitted thanks to a rare emotional outburst of Pericles, his friend, Phidias, died in prison. Another friend of his, Anaxagoras, was attacked by the Ecclesia (the Athenian Assembly) for his religious beliefs. It is possible that Plutarch’s account of Aspasia's trial and acqittal was a historical invention based on earlier slanders and ribald comedies. In his play, The Acharnians, Aristophanes blames Aspasia for the Peloponnesian War, claiming that the Megarian decree of Pericles, which excluded Megara from trade with Athens or its allies, was retaliation for prostitutes being kidnapped from the house of Aspasia by Megarians. Plutarch also reports the slurs of other comic poets, such as Eupolis and Cratinus. Douris appears to have promoted the view that Aspasia instigated both the Samian and Peloponnesian Wars. Aspasia was labeled the "New Omphale," "Deianira," "Hera" and "Helen." (Omphale and Deianira were respectively the Lydian queen who owned Heracles as a slave for a year and his long-suffering wife. The comedians parodied Pericles for resembling a Heracles under the control of an Omphale-like Aspasia.) Further attacks on Pericles' relationship with Aspasia are reported by Athenaeus. Pericles's own son, Xanthippus, who had political ambitions, did not hesitate to slander his father over his domestic affairs. The return of soldiers from the battle front brought the plague to Athens. In 429 B.C.E., Pericles witnessed the death of his sister and of both his legitimate sons from his first wife, Xanthippus and his beloved Paralus, from the disease. With his morale undermined, he burst into tears, and not even Aspasia could console him. Just before his death, the Athenians allowed a change in the citizenship law that made his half-Athenian son with Aspasia, Pericles the Younger, a citizen and legitimate heir. Pericles himself had proposed the law in 451 B.C.E. confining Athenian citizenship to those of Athenian parentage on both sides, to prevent aristocratic families from forming alliances with other cities. Pericles died in the autumn of 429 B.C.E..
Plutarch cites a dialogue by Aeschines Socraticus (now lost), to the effect that after Pericles's death Aspasia lived with Lysicles, an Athenian general and democratic leader, with whom she had another son; and that she helped him rise to a high position in Athens. Lysicles was killed in action in 428 B.C.E., and after his death there is no further record of Aspasia. The date given by most historians for her death (c. 401 B.C.E. - 400 B.C.E.) is based on the assessment that Aspasia died before the execution of Socrates in 399 B.C.E., a chronology which is implied in the structure of Aeschines' Aspasia. Aspasia appears in the philosophical writings of Plato, Xenophon, Aeschines Socraticus and Antisthenes. Some scholars suggest that Plato was impressed by her intelligence and wit and based his character Diotima in Symposium on her, while others believe that Diotima was in fact a historical figure. According to Charles Kahn, Professor of Philosophy at the University of Pennsylvania, Diotima is in many respects Plato's response to Aeschines' Aspasia. In Menexenus, Plato satirizes Aspasia's relationship with Pericles, and quotes Socrates as claiming that she trained many orators. Socrates' intention is to cast aspersions on Pericles' rhetorical abilities, claiming that, since the Athenian statesman was educated by Aspasia, he would be superior in rhetoric to someone educated by Antiphon. He also attributes authorship of Pericles’ Funeral Oration to Aspasia and attacks his contemporaries' veneration of Pericles. Kahn maintains that Plato has taken the idea of Aspasia as teacher of rhetoric for Pericles and Socrates from Aeschines. Xenophon mentions Aspasia twice in his Socratic writings: in Memorabilia and in Oeconomicus. In both cases her advice is recommended to Critobulus by Socrates. In Memorabilia Socrates quotes Aspasia as saying that the matchmaker should report truthfully on the good characteristics of the man. In Oeconomicus Socrates defers to Aspasia as being the one more knowledgeable about household management and the economic partnership between husband and wife. Painting of Hector Leroux (1682 - 1740), which portrays Pericles and Aspasia, admiring the gigantic statue of Athena in Phidias' studio. Aeschines Socraticus and Antisthenes each named a Socratic dialogue after Aspasia (though neither survives except in fragments). Our major sources for Aeschines Socraticus' Aspasia are Athenaeus, Plutarch, and Cicero. In the dialogue, Socrates recommends that Callias send his son Hipponicus to Aspasia for instructions. When Callias recoils at the notion of a female teacher, Socrates notes that Aspasia had favorably influenced Pericles and, after his death, Lysicles. In a section of the dialogue, preserved in Latin by Cicero, Aspasia figures as a "female Socrates," counseling first Xenophon's wife and then Xenophon (not the famous historian Xenophon) himself about acquiring virtue through self-knowledge. Aeschines presents Aspasia as a teacher and inspirer of excellence, connecting these virtues with her status as hetaira. Of Antisthenes' Aspasia only two or three quotations are extant. This dialogue contains both aspersions and anecdotes about Pericles. Antisthenes appears to have attacked not only Aspasia, but the entire family of Pericles, including his sons. 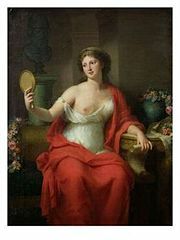 The philosopher believes that the great statesman chose the life of pleasure over virtue, presenting Aspasia as the personification of a life of self-indulgence. Aspasia appears in several significant works of modern literature. Her romantic attachment with Pericles particularly inspired the romanticists of the nineteenth century and the historical novelists of the twentieth century. In 1835 Lydia Child, an American abolitionist, novelist, and journalist published Philothea, a classical romance set in the days of Pericles and Aspasia. This book is regarded as her most successful and elaborate because the female characters, and especially Aspasia, are portrayed with beauty and delicacy. In 1836 Walter Savage Landor, an English writer and poet, published Pericles and Aspasia, a rendering of classical Athens through a series of imaginary letters, which contain numerous poems. The letters are frequently unfaithful to actual history but attempt to capture the spirit of the Age of Pericles. In 1876 Robert Hamerling published his novel Aspasia, a book about the manners and morals of the Age of Pericles and a work of cultural and historical interest. Giacomo Leopardi, an Italian poet influenced by the movement of romanticism, published a group of five poems known as the circle of Aspasia. The poems were inspired by his painful experience of desperate and unrequited love for a woman named Fanny Targioni Tozzetti, whom he called “Aspasia” after the companion of Pericles. In 1918 novelist and playwright George Cram Cook produced his first full-length play, The Athenian Women, portraying Aspasia leading a strike for peace. American writer Gertrude Atherton in The Immortal Marriage (1927) recreates the story of Pericles and Aspasia, and illustrates the period of the Samian War, the Peloponnesian War and the plague. Historically, Aspasia's name is closely associated with Pericles's glory and fame. Her reputation as a philosopher and rhetorician is mostly anecdotal, as are the details about her personal life. Some scholars suggest that Plato derived his portrayal of Aspasia as an intellectual from earlier Greek comedies, and that his remarks that she trained Pericles and Socrates in oratory should not be construed as historical fact. Whether the stories about Aspasia are fact or legend, no other woman achieved the same stature in ancient Greek history or literature. She is regarded by modern scholars as an exceptional person who distinguished herself due to her political influence and intellectual charisma. Although Athenian women were not accorded the same social and civic status as men, most Greek philosophers regarded women as being equally capable of developing the intellect and cultivating the soul. An ideal society required the participation of both enlightened men and enlightened women. Women did not participate in the public schools, but if a woman was educated at home, as Aspasia was, she was respected for her accomplishments. 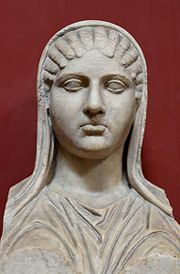 Scholars have concluded that Aspasia was almost certainly a hetaera because of the freedom and authority with which she moved about in society. Plutarch (46 – 127 C.E.) accepts her as a significant figure both politically and intellectually and expresses his admiration for a woman who "managed as she pleased the foremost men of the state, and afforded the philosophers occasion to discuss her in exalted terms and at great length." Lucian calls Aspasia a "model of wisdom," "the admired of the admirable Olympian" and lauds "her political knowledge and insight, her shrewdness and penetration.” (Lucian, A Portrait Study, XVII.) A Syriac text, according to which Aspasia composed a speech and instructed a man to read it for her in the courts, confirms Aspasia's reputation as a rhetorician. Aspasia is said by Suda, a tenth-century Byzantine encyclopedia, to have been "clever with regards to words," a sophist, and to have taught rhetoric. links Retrieved February 20, 2008. Aristophanes, Acharnians. See original text in Perseus program. Athenaeus, Deipnosophistae. University of Wisconsin Digital Collections Center. Cicero, De Inventione, I. See original text in the Latin Library. Diodorus Siculus, Library, XII. See original text in Perseus program. Plato, Menexenus. See original text in Perseus program. Thucydides, The Peloponnesian War, I and III. See original text in Perseus program. Xenophon, Oeconomicus. Transated by H.G. Dakyns. Adams, Henry Gardiner. A Cyclopaedia of Female Biography. 1857 Groombridge. Duyckinck, G.L. and E.A. Duyckinc. Cyclopedia of American Literature. C. Scribner, 1856. Samons, Loren J., II and Charles W. Fornara. Athens from Cleisthenes to Pericles. Berkeley: University of California Press, 1991. Glenn, Cheryl. "Locating Aspasia on the Rhetorical Map." Listening to Their Voices. Univ of South Carolina Press, 1997. ISBN 157003272-X. Anderson, D.D. The Origins and Development of the Literature of the Midwest. Dictionary of Midwestern Literature: Volume One: The Authors. by Philip A Greasley. Indiana University Press, 2001. ISBN 0253336090. McClure, Laura. Spoken Like a Woman: Speech and Gender in Athenian Drama. Princeton University Press, 1999. ISBN 0691017301 "The City of Words: Speech in the Athenian Polis." McGlew, James F. Citizens on Stage: Comedy and Political Culture in the Athenian Democracy. University of Michigan Press, 2002. ISBN 0472112856 "Exposing Hypocrisie: Pericles and Cratinus' Dionysalexandros." Monoson, Sara. Plato's Democratic Entanglements. Hackett Publishing, 2002. ISBN 0691043663 "Plato's Opposition to the Veneration of Pericles." Ostwald, M. The Cambridge Ancient History, edited by David M. Lewis, John Boardman, J. K. Davies, M. Ostwald (Volume V) Cambridge University Press, 1992. ISBN 052123347X "Athens as a Cultural Center." Powell, Anton. The Greek World. Routledge (UK), 1995. ISBN 0415060311 "Athens' Pretty Face: Anti-feminine Rhetoric and Fifth-century Controversy over the Parthenon." Rose, Martha L. The Staff of Oedipus. University of Michigan Press, 2003. ISBN 0472113399 "Demosthenes' Stutter: Overcoming Impairment." Rothwell, Kenneth Sprague. Politics and Persuasion in Aristophanes' Ecclesiazusae. Brill Academic Publishers, 1990. ISBN 9004091858 "Critical Problems in the Ecclesiazusae"
Smith, William. A History of Greece. R. B. Collins, 1855. "Death and Character of Pericles." Southall, Aidan. The City in Time and Space. Cambridge University Press, 1999. ISBN 0521784328 "Greece and Rome." Sykoutris, Ioannis. Symposium (Introduction and Comments) -in Greek Estia, 1934. Taylor, A. E. Plato: The Man and His Work. Courier Dover Publications, 2001. ISBN 0486416054 "Minor Socratic Dialogues: Hippias Major, Hippias Minor, Ion, Menexenus." Taylor, Joan E. Jewish Women Philosophers of First-Century Alexandria. Oxford University Press. 2004. ISBN 0199259615 "Greece and Rome." Becq de Fouquières, Louis. Aspasie de Milet. (in French) Didier, 1872. Brainard, Jennifer Aspasia of Athens. Encyclopaedia Romana Aspasia of Miletus. Henry, Madeleine and N.S. Gill. "Aspasia of Miletus - Prisoner of History". Lendering, Jona. "Aspasia of Miletus". This page was last modified on 20 April 2016, at 19:58.